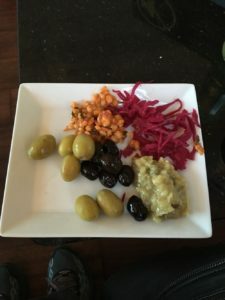 Before I forget – and this is being written from the Turkish Airlines Lounge in Istanbul – I just adore flying Turkish Airlines. At least in business class, no experience otherwise. The plane itself is comfortable, they provide slippers. I don’t have a clue about their entertainment program since I enjoying watching the flight path. The service is excellent, the chefs on board prepare the food to order. The cart comes by with the starters so that you can mix and match. I never go around to desert since I decided that sleep wasn’t a bad idea at all. But the icing on the cake? Besides the lovely lounge in the airport which is huge, open, airy with multiple snack stations and a full array of munchies, foods, drinks, teas and coffees? We were parked at an outer location which meant the usual tramp and bus. There was a separate bus for business class. Not just a simple sign in the window, this was decked out with a full elegant wrap clearly distinguishing it from the ordinary white economy class. Business Class clearly emblazoned on the side, gold on chocolate brown. Since our flight was late getting in. Oh – that was interesting. Apparently going around too many times on approach to SFO make the incoming TK 079 short on fuel. So they landed at OAK. Seriously. Refueled, took off, circled around, then landed on the SFO runway right across the bay. End result was that we were a couple hours late on departure. Fine with me since that meant a shorter time hanging out in Ataturk. And I underestimated. Apparently the time zone different from SFO to IST is 11 hours… flip my bodies schedule on its head why don’t we. Visit Lemur’s Park, a botanical park where nine species of lemur can be observed roaming freely. Discover the sacred royal village of Ambohimanga, a UNESCO World Heritage Site. Explore the sandstone canyons and waterfalls of Isalo National Park. Learn about sustainability and biodiversity in Ranomafana National Park at Centre Valbio, a facility run by Dr. Patricia Wright that is now Madagascar’s leading field research center. Experience a taste of Malagasy life while exploring Ambatolampy and visiting a pot factory which are used all throughout the island. Investigate Madagascar’s over 12,000 plant species (up to 80% are endemic) , showcasing Madagascar, as one of the most, diverse floras in the world. Witness extraordinary biogeography as Madagascar houses 100% of the world’s lemurs, half of the world’s chameleon populations and 6% of the world’s amphibian populations. I will continue to think about this as we deal with yet another day underway. SFO-IST arriving today (1 June) then early morning from here to Madagascar. I did tell you that was where we are going?